On the eve of his 70th birthday, BBC Radio 4 pays tribute to one of the world's most famous living scientists, Prof Stephen Hawking. 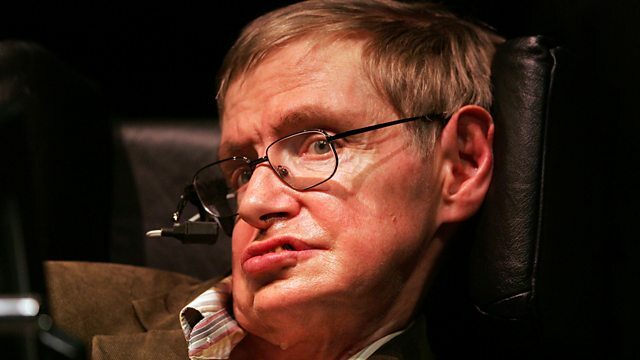 On the eve of his 70th birthday, BBC Radio 4 pays tribute to the world's most famous living scientist Professor Stephen Hawking. Using letters, archive recordings and interviews, each programme will focus on one aspect of Professor Hawking's life. This is a series which will reveal the thoughts, concerns and humour of one of the icons of modern science. Lord Professor Martin Rees, the Astronomer Royal (a student at Cambridge with Hawking); Cosmologist Professor Paul Shellard (a PhD student of Hawking's in the 1980s); Producer Ben Bowie (producer of 'Stephen Hawking's Universe' for Discovery); Biographer Kitty Ferguson; his personal assistant Judith Croasdell; his graduate assistant Sam Blackburn (who looks after the voice/chair technology). Stephen Hawking was, from 1979 to 2009, the Lucasian Professor of Mathematics at the University of Cambridge (following in the footsteps of Sir Isaac Newton). He is a Companion of Honour, Commander of the British Empire, Honorary Fellow of the Royal Society, lifetime member of the Pontifical Academy of Science and, in 2009, was awarded the Presidential Medal of Freedom, the highest civilian award in the United States. In the series, the letters were read by Ewan Bailey, Alison Goldie, Eleanor Dobing, and Michael Roberts. Letters from children were read by Joe, Amelie and Lola Farnworth-Mayers, Florence Andrews, and Jules Stockwell. Original music throughout the series was composed by Nick Romero and performed by Carla Rees. Programmes and videos about the world's most famous scientist and his work.